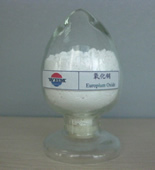 Europium, atomic no. : 63, symbol as Eu, weight at 151.96, is utilized primarily for its unique luminescent behavior. Excitation of the Europium atom by absorption of ultra violet radiation can result in specific energy level transitions within the atom creating an emission of visible radiation. In energy efficient fluorescent lighting, Europium provides not only the necessary red, but also the blue. Several commercial blue phosphors are based on Europium for color TV, computer screens and fluorescent lamps. Its luminescence is also valuable in medical, surgical and biochemical applications.